The insufflant system (i.e., insufflator, tubing, and insufflant gas) is essential for establishing a pneumoperitoneum, or pneumoretroperitoneum, as the case may be. Insufflation is commenced after either closed (i.e., Veress needle) or open (i.e., Hasson cannula) access to the desired cavity is optimally established. Most commonly, C02 is used as the insufflant because it does not support combustion and is highly soluble in blood (14). However, in patients with chronic respiratory disease, C02 may accumulate in the blood stream to dangerous levels. In such cases, helium may be used for insufflation once the initial pneumoperitoneum has been established with C02. The drawback of helium is that it is much less soluble in blood than C02 but may be useful in avoiding hypercarbia. Other gases, such as room air, oxygen, and nitrous oxide are no longer routinely used owing to their potential side effects (e.g., air embolus, intra-abdominal explosion, potential to support combustion). "Noble gases" such as xenon, argon, and krypton are inert and nonflammable but are not routinely used for insufflation owing to their high cost and poor solubility in blood. Initially, insufflator pressure is set at 20 mmHg with a rate of gas flow of 1L/min. 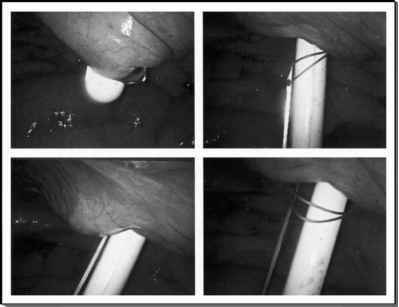 Once safe entry into the peritoneal cavity has been achieved, the flow can be increased to maximum. The insufflated C02 is typically cold (21°C) and is unhumidified. This results in minimal systemic hypothermia and likely contributes to problems of fogging of the endoscope during the procedure. Accessory devices for insufflators that warm and humidify C02 to physiologic conditions are available. However, the benefit of this technology is largely of an anecdotal nature. Indeed, warming the insufflant by itself may be of no benefit or even detrimental.